One way to combat the frackers! As an Ecotricity customer benefiting from our 100% Green Electricity, award-winning customer service and stable, ethical pricing we thought you might like to know about our latest refer-a-friend offer. We know our customers are our biggest fans and the best people to promote what we do. It’s a simple truth that the more people that join us, the more we can do. We call this People:Power. Simply invite your friends to join us using your unique code below. You will both then receive vouchers worth £50 to spend at Ecotopia – when they switch their energy supply to us. As always, we take the money our customers spend on their energy bills and use it to build new sources of green energy – turning ‘Bills into Mills’. 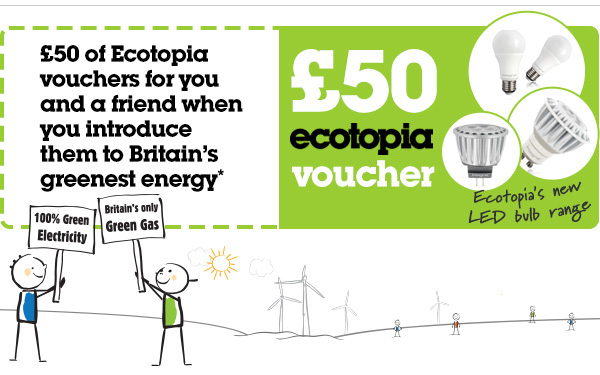 Invite a friend to join Ecotricity and, when they sign up, you’ll each receive vouchers worth £50 to spend at Ecotopia* as a thank you. Forward this email to your friend. Pass on your unique invitation code, shown below, and tell your friend to quote it when they switch to Ecotricity either online or on the phone. Or share your invite on Twitter or Facebook! Mr Andrew Chyba thinks you deserve more from your energy supplier. The satisfaction of seeing your energy bills used to create new sources of green energy. It costs less to be with us than the standard Big Six tariff in your region, for the average customer. Great customer service – the best you’ll find, in fact. We’ll send you (and the friend who referred you to us) vouchers worth £50 to spend at Ecotopia when you join us. To find out more, simply call our Welcome Team on 08000 302 302 or visit us online. * Terms & Conditions apply. View the full terms and conditions here. We’d love to hear from you, contact us with your questions & comments. And of course you can unsubscribe. This entry was posted in Uncategorized on November 5, 2014 by Bridgend's Green Leftie.